14 coats total. Custom color. Sprayed on with no seams, both sides. 14 layers total, blue base, purple tint, gold flakes, lots of clearcoat. Wet sanded and polished. Whoa dude that looks insanely good! Who does this in Vancouver? Thanks! The Dip Dr in Surrey. Sprayed on, cures in 24 to 48 hours into a wrap. The oem red underneath is preserved. This can be ripped off like any wrap when you want to go back to red. Usually if it's just the exterior (what most people do) it's 800 plus tax only. 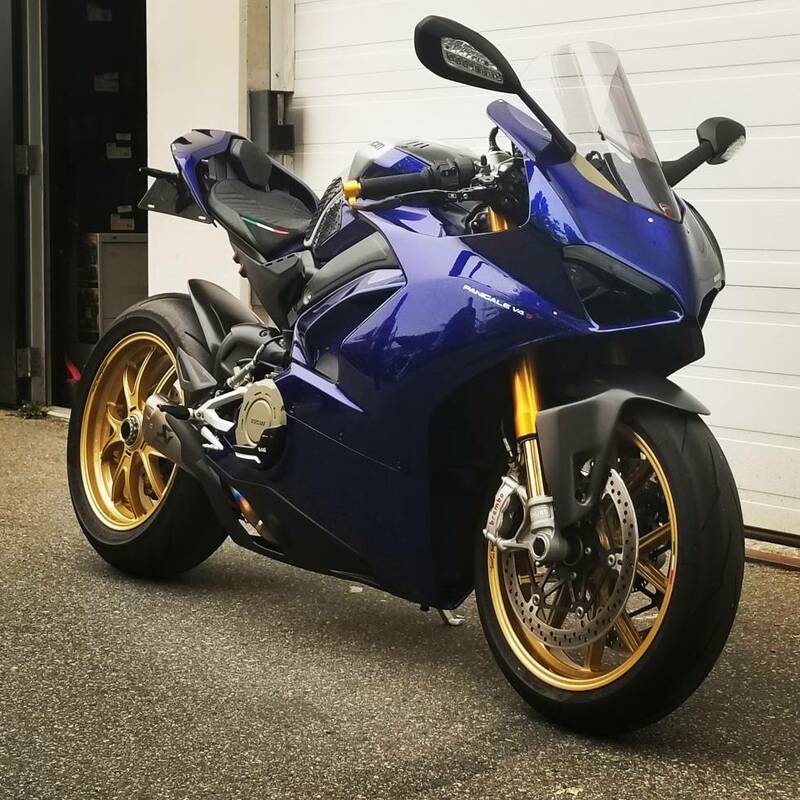 I opted for a more custom color with more layers, super high gloss, both side of all parts, brushed aluminum tank, custom black DUCATI decals on tank, custom red S decal on the side fairings, full wet sand, polish, and flow clear for a deep gloss. So those are all extra. All in you're looking at about $1500-1800 including tax. Oh wow that’s not bad at all for full custom! Does it feel like normal paint with clear? Yes sir. And looks like normal paint as well. Looks like a killer job. 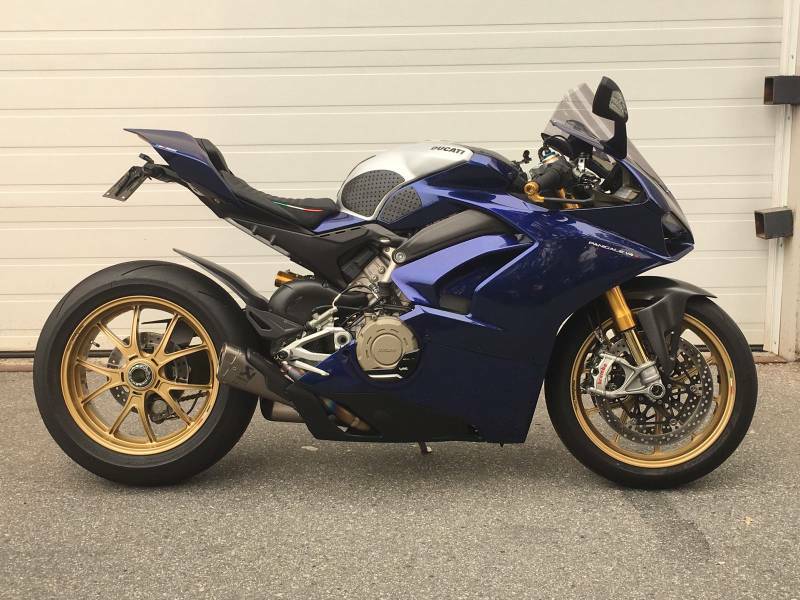 I've been wanting to do a Nardo grey on mine but all new fairings to preserve the stock + paint was pretty cost prohibitive. This may be the ticket! It looks great Nitrouz! And most of all, it's unique. Did you get a new tank or did you brushed the original one? Thanks! My favorite color of all time is the San Marino Blue on my BMW M6, so this is as close to that as possible, plus gold flakes to tie in my wheels. The tank is actually a brushed aluminum wrap. It's aluminum anyways, but since I'm keeping the rest of the oem red paint underneath I didn't want to just mess with the tank. Just holding on to resale value when the time comes to trade in.